4 on 4 – with subbing on the fly (incoming players must tag hands of the player coming off). Minimum 1 of each gender on the field, no gender matching enforced. Stall Count of 5 – can be counted by any person from anywhere on the field. Only one person can count at a time. 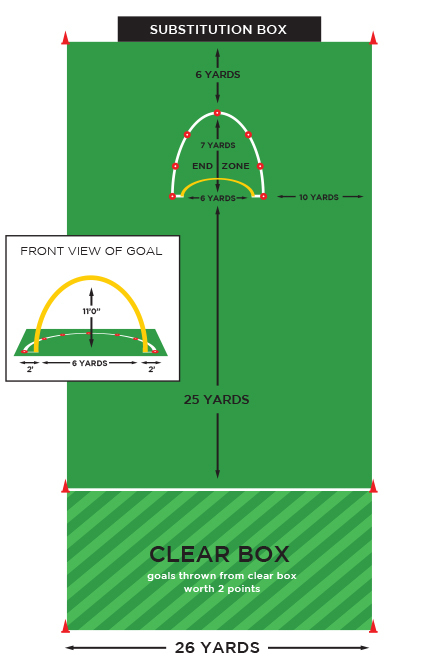 Scoring – One point for a completed pass that travels through the hoop and is caught in the end zone by your teammate; two points if the disc is thrown from beyond the clear line. Turnovers – Whenever a turnover happens, the possession changes, and the new offensive team must ‘clear’ the disc by taking it into the clear box, and can then attack the goal. Clearing – “Make it take it” rules apply, so if you score – your team must clear the disc and then you can attack again. 3 in the Key – Offensive players may only stay in the end zone for 3 seconds at a time. After 3 seconds they must leave the end zone and return in order to be an eligible scoring receiver. No Goaltending – Defenders must be within 10 feet of an offensive player to remain in the end zone. ‘No goaltending’ call results in a stoppage of play and repositioning of the offending player to the closest point outside the end zone. Some versions of Goaltimate allow setting picks – we are currently not playing with picks. Players may not break the plane of the hoop when passing for a goal. This is considered the same as a travel call – and the disc will go back to the shooting player at the stall count at which he/she threw the disc. A goal is awarded on any reception for which the first point of contact is in the end zone, and the disc passed through the front of the hoop, or if the receiving player’s body creates a path connecting the disc to the first point of contact in the end zone passing through the front of the hoop. If a player catches a disc in the goal that has hit the hoop but passes through, the catch is a goal. If a player hits the hoop (but does not destroy it/move it out of position to the point of pausing play to readjust) on his/her way to scoring a goal. The catch is considered a goal. A two point goal that is tipped by either an offensive or defensive player is still worth two points. A player subbing must touch hands with the subee in order to be considered live on the playing field. Subees may not leave the sub box until they are touched. Violations of this will result in a turnover (same as Ultimate speed point). Currently we’re in the planning stages of events in Waterloo, North Bay and Ottawa! 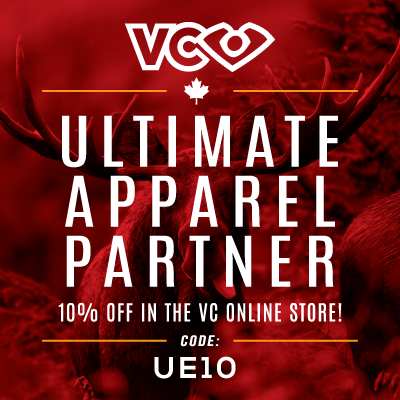 Think your city should have a stop on the provincial Goaltimate circuit? Contact us and we’ll look into the feasibility of setting up local competition.